Every time I publish another one of CoverDrive’s Tesla (TSLA) earnings forecasts (always founded on his estimate of the upcoming deliveries number), I take a lot of incoming. Not just from bulls, who insist CoverDrive has grossly underestimated what Tesla will accomplish, but from bears as well, who feel he is too generous to Tesla, and are certain he must have imbibed a few too many of his favorite oatmeal stouts before turning to his spreadsheets. And yet, time after time, CoverDrive delivers the goods. His initial estimates are good. His refined calculations, later in the quarter, are even better. And his final EPS forecast after release of the delivery numbers is best of all. CoverDrive initially based his forecast on 32,000 deliveries. He revised that down to 30,000 a month ago. He was off by 20. OK, he wasn’t quite that good. He was about 500 high on the Models S and X and 500 shy on the Model 3. In other words, CoverDrive imagined Tesla would favor its cars that lose less money over its car that loses more money. He’s always had a soft spot for Tesla in that way. CoverDrive’s delivery estimates form the foundation for his earnings forecast. And those forecasts, too, are uncannily accurate. By contrast, the analysts’ “consensus” earnings number invariably begins the quarter at a distant remove from CoverDrive’s estimate. Ineluctably, as the earnings release date approaches, the consensus number inches ever closer to CoverDrive’s, until finally there is almost convergence. The same thing will happen again over the next several weeks. CoverDrive sent me a note after the delivery numbers were published. Essentially, he’s hanging tough with his Q1 EPS forecast. The different mix of cars caused him to pencil in only another $12 million in GAAP losses. He still sees the GAAP loss coming in at about $900 million. In analyst-speak, that translates to a non-GAAP EPS of -$4.25. That’s quite different from the analysts’ Q1 EPS consensus, which, as I write this, is closer to -$3.25. What do you think will happen between now and the second week of May, when we see the Q1 financials? Will CoverDrive confess error and move in the direction of the analysts? Or will the analysts come crawling to CoverDrive? 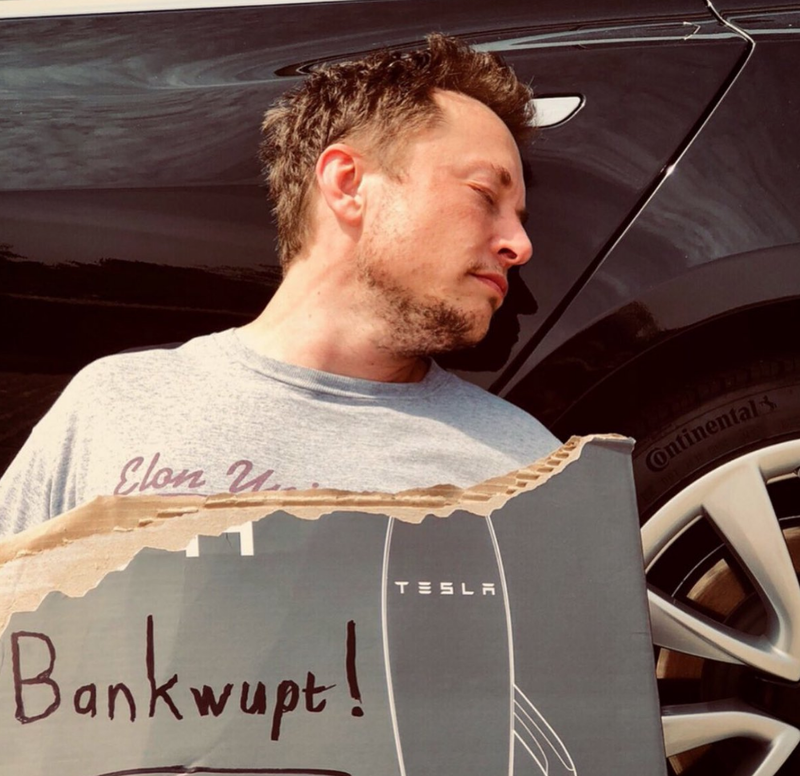 Two cautionary notes from CoverDrive: (1) he has assumed no ZEV credit revenue this quarter, and (2) he has assumed the same 13.2% gross margin even despite the richer mix of Model 3 cars (which are sure to have a negative gross margin). Back in December, Adam Jonas wrote a note estimating Tesla would deliver 8,000 Model 3 cars in Q1. Lo and behold, Tesla delivered 8,180. To my knowledge, no one came closer than Jonas on the Model 3 number. Not even CoverDrive who penciled in 7,500 Model 3 deliveries for his Q1 EPS forecast. Fortunately, CoverDrive is holding fast to the Jonas forecast for Model 3 deliveries during the remainder of 2018 (24k in Q2, 32k in Q3, 46k in Q4). CoverDrive has grounded his 2018 GAAP loss forecast ($2.8 billion) on the Jonas Model 3 numbers. Several others have already written great pieces about Tesla’s Q1 deliveries report: Anton Wahlman here and here, Bill Maurer here, and EnerTuition here. I don’t want to repeat what they’ve said. I have these thoughts. First, this was the longest delivery report ever, by a long margin. Its tone combines fantasy and defiance in a manner that is vintage Elon Musk. I would wager Musk has not only pushed aside Doug Field in handling the production line, but also has decided he is best suited to handle his company’s investor communications. Second, the stunningly selective sifting of data continues. In the Q4 deliveries report, Tesla boasted about the delivery numbers. This time, the delivery numbers are unimpressive, so it boasts about the production numbers. Help me out here. In Q4, Tesla said it achieved an exit rate of 793 per week. In Q1, Tesla reported production of 9,766 Model 3 cars over 13 weeks. That works out to… 751 cars per week. The share price spiked on this news. What does that tell you about the (I’m searching for a neutral term) thought processes (ah, that works) of those buying in contrast with the thought processes of those selling? I don’t know what it tells you, but I know what it told me. I took the opportunity to add just a bit to my long-dated put options. Third, the Models S and X have a significantly higher gross margin than the Model 3. Yet in the quarter’s final week, Tesla pulled workers from the Model S and X production lines and moved them to the Model 3 line. Tesla wanted to increase its Q1 losses. Tesla knows demand for the Models S and X is weak and waning. Tesla continues to target a production rate of approximately 5,000 units per week in about three months, laying the groundwork for Q3 to have the long-sought ideal combination of high volume, good gross margin and strong positive operating cash flow. I’m confident this forecast will come back to haunt Tesla. CoverDrive’s Q3 forecast is for $647 million in GAAP losses. That won’t translate to “strong positive operating cash flow” in Q3. It won’t translate to any positive operating cash flow at all. As a result, Tesla does not require an equity or debt raise this year, apart from standard credit lines. 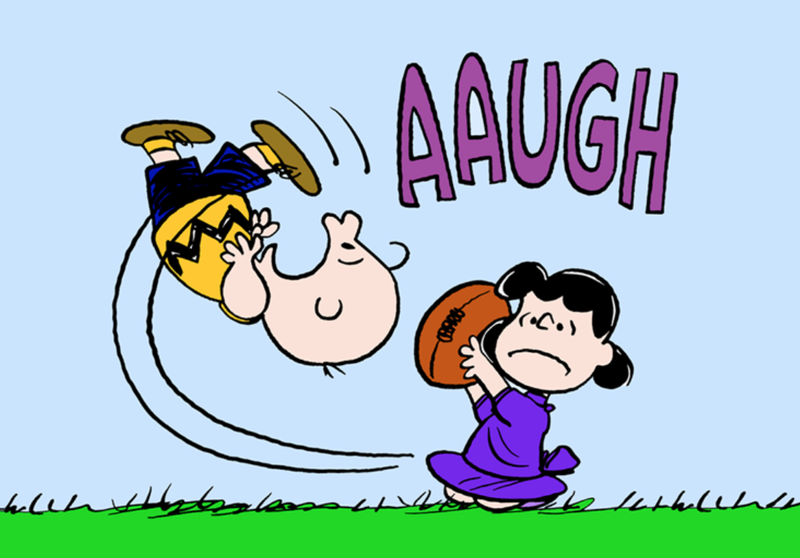 At this point, Tesla investors are Charley Brown, and Tesla is Lucy holding the football. Add up the capital raises since October of 2016. It will serve as a useful education. What weekly rate will they report at the end of the quarter? Just as they did at the end of Q4, it will be whatever they need to keep the story alive. They may not need to report 2500/wk, but certainly more than 2000. Tesla settled for exactly 2,000 as the number it would serve up this time for consumption by the gullible. A number any higher would have been too unbelievable even for the most faithful Tesla fans. The quality of Model 3 coming out of production is at the highest level we have seen across all our products. Really? How about this and this? And those touchscreen problems I’ve been writing about are far from resolved. There’s more evidence that the theory of my engineer correspondents is on target. 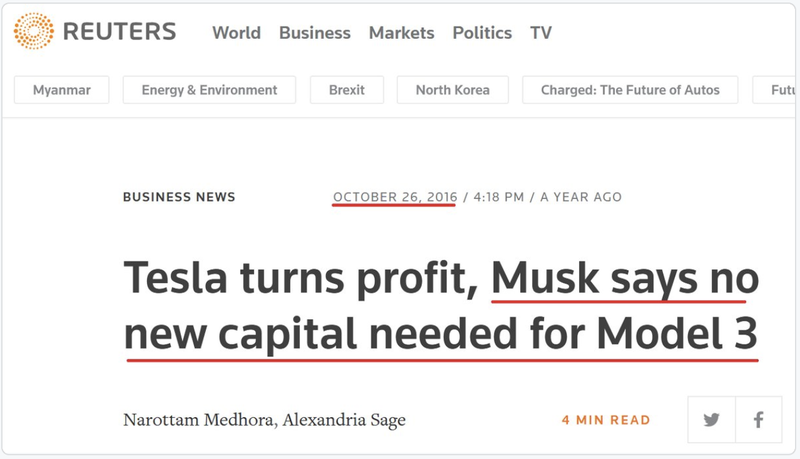 When will Tesla come clean about them? Yes, mere anecdotes. Let’s all keep watching. I’m confident Tesla will not achieve “strong positive operating cash flow” in Q3. I very much doubt it will achieve any positive operating cash flow in 2018. Tesla will instead rack up at least $2.5 billion in GAAP losses. More likely closer to $3 billion. Tesla finished 2017 with deeply negative working capital. It produced 4,500 more cars in Q1 than it delivered. These situations are simply unsustainable. I have no doubt that unless Tesla raises capital in 2018, it will be insolvent. Tapping existing credit lines will not suffice. Tesla will need to expand those lines (into the teeth of higher interest rates) and also issue more stock. We will all look back on the latest delivery report as a deeply misleading document. Seeking Alpha has put most of my work behind a pay wall. However, the suits have agreed to turn their backs while five of my articles jump the fence. I particularly commend to your attention my 23-point short thesis and CoverDrive’s explanation of why Tesla is structurally bankrupt. And also, to those tempted to crow about Tesla’s terrific gross margins, I would first commend them to a piece entitled Just Say ‘No’ To Tesla’s Misleading Margin Metric.